I wasn’t that hungry to begin with. Blame it on the oppressive heat and humidity in the city that evening. Blame it on the seven block walk to our favorite Ramen place on 28th Street. Or, best of all, blame it on the viral bronchial whatever I pick up in late June. I just didn’t feel like eating, but we went anyway. I coughed all the way to dinner and all the way back. I coughed at night, all through the day and in the morning…especially in the morning. I’m coughing as I write this. I felt like I was burning up with a fever, but the thermometer kept reporting I was hovering around 98.2. That’s a raging fever in my book, for me. My “normal” body temperature is 97.7. Funny thing, our thermometer. I ordered it to reveal my real fever…I yelled and cursed the little plastic thing into telling the truth. We walked back to our hotel after I forced half a bowl of Japanese Pork Fried Rice. As we approached Herald Square, we encountered a thousand partiers filling the small wedge of a park in front of JCP and Macy’s. We had to cross the street. To me it seemed all the sweating young women and men were wearing some kind of green glowing headbands and waving radioactive plastic wands. I thought I was having an LSD flashback, until I remembered that I never took LSD. I made a few moves on my ongoing Scrabble games and I tried to read the book I had hauled along. Buy I couldn’t keep my eye lids open. I took a hit from my bottle of Robitussin and fell immediately fell asleep. Mariam had to turn my reading light off. Then, for the second morning, I woke gagging and coughing. I was coughing up phlegm that had the color of certain appetizers you get at most Mexican restaurants. It alarmed me to think that something so vulgar could reside inside my body…especially so near my mouth. It was 5:16 am. I was determined that my hacking and gagging was not going to keep Mariam from sleeping in a little that morning. I got dressed. 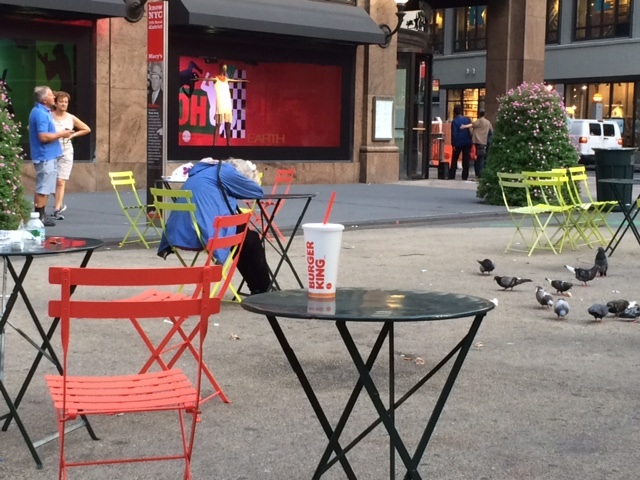 I was going over to Herald Square and find a bench and read (and cough) and not disturb my wife. She was awake, of course, and begged me not to go because she said it was not a safe thing to do. I pulled back the shade and looked down to Broadway. People were moving about. Getting Starbucks. Buying the Times. Going to work. I told her I would leave my iPhone on and that I’d be “right down there”. I was gone before she could say anymore. When I got to Herald Square, I found the park where I planned to find the shade and quiet to read, was gated and locked for the night. I walked over to the public space in front of Macy’s Main entrance. Here is where the Rockettes kicked their legs on Thanksgiving. This is where the parade ended. This was where Matt Lauer sits and describes the floats of Mickey Mouse and Bart Simpson. This is where the high school marching bands would do their last rendition of “New York, New York”. This was the culmination of a year of fund-raising at Council Bluffs, Iowa. These kids would never forget their day in the parade. All the partying Yuppies were gone. They had left the streets littered with the leftovers of their fun and were now fast asleep in shared apartments in Chelsea, Astoria or Bay Ridge. I found a small metal table and chair in the shade of the rising sun. It was going to be as hot as hades that day. I looked around and then opened my book. I read a few lines. I closed the book and looked around again. A woman was bent over a table. Who was she? There was a big guy taking up three chairs. Was he a father? I looked at a family of tourists strolling past Macy’s, the parent’s intent on keeping the children from seeing the sleeping homeless. I thought of the glamour and styles and perfumes and jewelry that were just beyond the plate-glass window. Soon, the crews would arrive to hose down the streets and make the place sparkle for the tourists. The police have already poked at a few of the sleepers. Where would they go? I sat for two hours until I felt Mariam had rested before I walked back to the hotel. I had an air-conditioned room and a clean bed to nap on. The people I left behind had no place to relieve themselves. When I watch the next Macy’s Thanksgiving Parade…I’ll be thankful, you can be sure of that. The images of those lost and forgotten people will stay with me for a very long time. 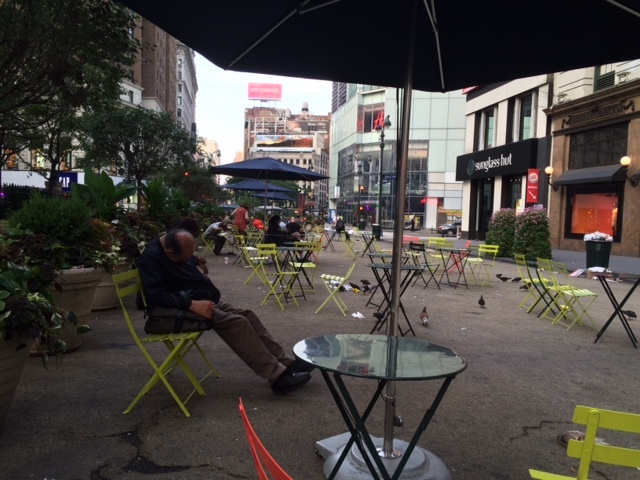 This entry was posted in Blogging, Everyday Events, Melancholy Thoughts, New York City, non-fiction, Public Parks, Real Personal History and tagged Broadway, Herald Square, homeless, Macy's, street parties.